Kent Thompson is a man who builds things. He builds stories into plays and theatres into institutions. Most people have a defining moment in their life, a moment that all roads lead back to. When I was in high school the Alabama Shakespeare Festival announced it was producing Peter Pan, so I convinced my mother to drive me the two and a half hours to Montgomery to audition. My mother later admitted she only allowed me to audition because since I was a chesty 15 year old girl who couldn't really sing, she was sure I would never be cast. But I was. Nothing about it was practical. But somehow my mother, who knew nothing about the theatre, recognized that this was an experience I couldn’t pass up. So my grandmother and I moved into a furnished apartment for 10 weeks, which I’m sure was financed on credit cards. My mother drove up on the weekends to play the role of reluctant stage mother. Working with the company of Peter Pan was a life changing experience. Most of the cast came in from New York and a few had Broadway credits, which for a kid who spent her spare time pouring over old Playbills, was magical. It was in the rehearsal rooms of the Alabama Shakespeare Festival that I learned what it meant to be a working theatre professional. The production was directed by Kent Thompson, who was then the artistic director of the Alabama Shakespeare Festival. Soft-spoken, with an understated, dry sense of humor, Kent is very much a gentleman. Perhaps Kent's greatest legacy at ASF was the creation of the Southern Writers' Project, which shepherded new plays focusing on Southern and African-American culture, to the stage. As I got older and my focus shifted from acting to writing I lied about my age so that I could participate in their inaugural Young Southern Writers’ Project. Soon I was invited to the Southern Writers' Project where I was given time, space, and a cast of smart actors who challenged me as a writer. At one point Kent stopped an actor who was reading a long monologue about something that happened offstage. And then he taught me a valuable lesson about active verses passive choices: an audience would rather see a moment come to life than hear about it. It’s a lesson that has stayed with me all these years and good advice for lives lived both on and off the stage. As a lifelong theatre artist, Kent understands the challenges that artists face. After I had a play at the Royal Court in London, Kent offered me my first commission. That commission kept me afloat while I was writing and bridged the gap between other paying gigs. The play I wrote became Gee’s Bend, my most successful play so far. 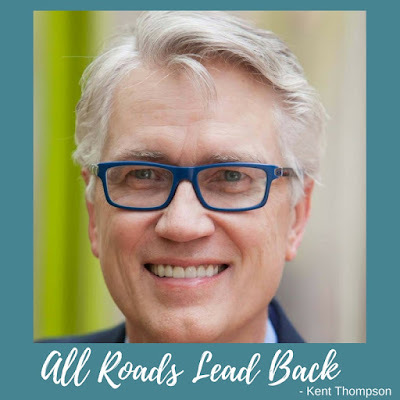 After 16 years Kent left the Alabama Shakespeare and became the artistic director of the Denver Center for the Performing Arts. There he launched the New Play Summit, a new play development program that now attracts theatre artists from around the country. Not only is he committed to commissioning playwrights, but he understands the value of then shepherding those plays into production. Once again Kent offered me a commission; the play, written just after my mother died, became a sweet little love story about death. The New Play Summit has evolved into something more than a showcase for new work; it has become a place where artists come together for fellowship and dialogue. Kent's commitment to diversity has seen the voices of more women and people of color represented on the stage. The Women's Voices Fund, which he created thanks to support from major donors, actively commissions new work each year. Kent was born the son of a Southern Baptist Preacher, who held a PhD from the University of Edinburough and was mentored by Martin Luther King, Sr. It might seem unlikely for a preacher’s son to grow up to be a theatre artist (or maybe not), but growing up listening to his father preach had an unexpected influence on him as an artist. His father was doing from the pulpit what Kent has always tried to do in the theatre: promote dialogue. “I watched that from my dad every week,” he tells me over dinner. “Let’s talk about what’s happening now. 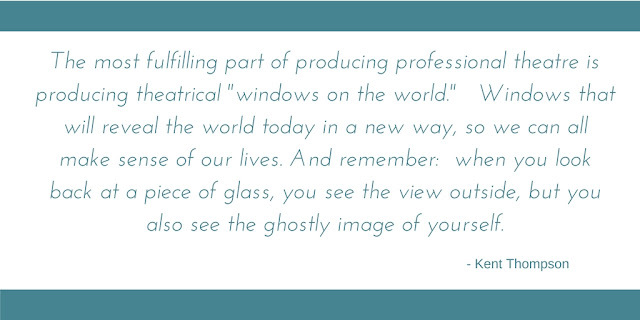 We have to talk to one another.” That philosophy is a driving force behind the work Kent chooses to produce. This spring I learned that Kent would be stepping down as the artistic director of the theatre after 12 years. I decided to fly out to Denver to see his final production. Kent graciously agreed to dinner. We talked about creating new work, the challenges of making good theatre while also making money, and our journey to where we are today. We talked about our losses over the years, of parents and spouses. I asked him how he raised his son, now grown and in graduate school, while running a theatre; those who do it successfully continue to be an inspiration to me. I savored every moment. As we said goodbye I awkwardly tried to say thank you, to somehow convey the respect I have for the work he's done and what his faith in me has meant all these years. He said, “Now you’re doing the same thing.” And I suppose am I through my students. Kent closed his show at the Denver Center after also celebrating his final New Play Summit. For now, he plans to finish a book on directing which he has been contracted to write. He and his wife, actress Kathleen McCall will continue working with Denver Health where they are advocates and fundraisers for the Child and Adolescent Psychiatric Unit. My guess is that he will find his way back to a theatre where he will continue to make plays and inspire others. Learn more about the 40 Lunches Project here. Follow along on Facebook and share it with a friend. Love this! I seriously can't get enough of these "lunches." I live about 45 minutes from Montgomery and will have to look up the Festival. Thanks! How clear, present, and beautifully rendered. Mr. Thompson is a treasure, and your writing is a treasure. May you both continue to thrive.